A treat for all hardware enthusiasts before the New Year! The news elaborates that the processor which will be powering Apple’s new Mac Pro desktop seems to be removable in nature, means that you can upgrade your CPU anytime you want in future. Isn’t that amazing? Let’s dig into how Apple made this possible! Apple is always a step ahead whenever it comes to competition and competition means development. 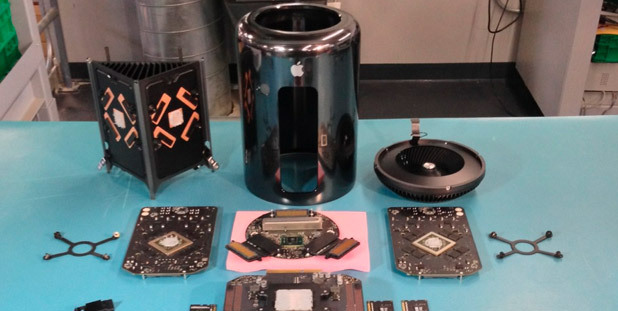 A detailed look at the Apple’s new Mac Pro teardown pictures released by Other World Computing shows that the processor (Intel Xeon) present in Mac Pro is socketed and can be easily removed from the system if you want to upgrade or change the processor with a new one. This feature is one of a kind and first ever introduced in any device. I have seen that in other systems, Apple have not supported these kind of modifications – not even for the professional-work oriented MacBook Pro lineup. There are some decisions which Mac users are not happy with like the permanent soldering in RAM. Apple hopefully wont ever tweak with this as this helps them to save a lot of space, eventually making their devices portable and ultra-thin. The cylindrical Mac Pro takes up a volume just one-eighth of that of a traditional desktop predecessor. Here, Apple has reduced the size at the cost of upgradability, which is good. But in this case, Apple gives a double bonanza. Alongwith the socketed CPU concept, the new Mac Pro will also host a user-upgradable RAM slot. Yes, your doubt is correct! Apple will be using traditional RAM slots for this product. It will be interesting how Apple will manage the space in this device and also infuse these specialties! But it all ends here. No more user-upgradable parts. To save some space and money, Apple’s new Mac Pro uses custom-designed graphics cards and proprietary based interface for its hard-drives (flash based). It can be realized that the third party accessory makers could easily make compatible hardware in the coming days but still I doubt that whether those parts or any other parts inserted from outside by the user’s would be compatible with Apple OS X or not! Apple in Mac Pro has allowed expansion through external peripherals unlike traditional Pc’s where you can add internal components like RAM and multiple hard drives. This has been done in order to reduce the size of the desktop. To end with, the Mac Pro powers six high-speed Thunderbolt 2 ports and thus allows quite a few numbers of bandwidth-consuming accessories which can be plugged into the machine. This Mac will also sport four USB 3.0 ports, an HDMI 1.4 video output and two Gigabit Ethernet inputs also. All in all, this Mac can be easily tagged as Apple’s most expandable Mac till date. For more, we have to wait and see!